may prevent symptoms of hangover. Described by some researchers as a miracle hangover cure, dihydromyricetin is a natural compound that has been much-studied in recent years. Also known as ampelopsin, this molecule is found in many plants of the Ampelopsis genus such as Ampelopsis grossedentata, Ampelopsis japonica and Ampelopsis megalophylla. This natural active principle has also been identified in Hovenia dulcis, a renowned medicinal plant of the Asian pharmacopoeia. Used for centuries in China, Japan and Korea, this plant is recommended for a number of situations, both for its laxative properties as well as for treating fever, parasitic infections and liver problems. It was this latter aspect that drew researchers to investigate the potential of dihydromyricetin for mitigating the unwelcome effects of alcohol. In addition to protecting the liver against alcohol-related damage, it can help avoid that ‘morning after’ feeling. - combatting alcohol-induced toxicity by protecting and detoxifying the liver. These recent discoveries have led to dihydromyricetin being hailed as a ‘miracle hangover cure’. Because of its antioxidant and liver-protective properties, this flavonoid is also used to treat certain liver diseases and to support withdrawal from alcohol. Derived from plants, this natural active principle has the added advantage of being completely safe, with no side-effects reported to date from using this product. 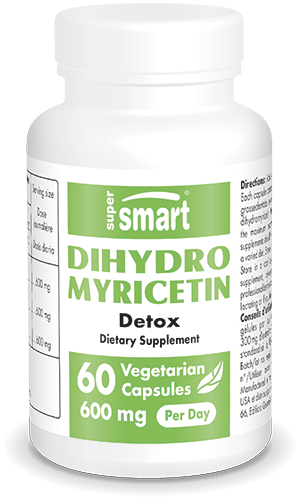 The benefits of dihydromyricetin are now available in the form of vegetarian capsules. Each capsule contains 300mg of Ampelopsis grossedentata extract standardised to 98% dihydromyricetin, an optimal level which makes the suggested dose two capsules a day. This dose can, however, be adjusted according to your needs and the advice of your therapist. You may also be interested in other products that help combat the harmful effects of alcohol: the new formulation Alcohol Detox, the natural extract Kudzu, and the famous Ayurvedic formulation LIV 52®.